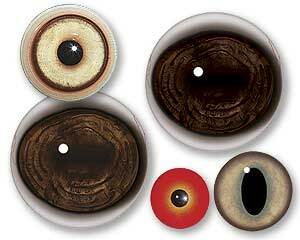 Van Dyke's Taxidermy Supply offers a superior selection of glass eyes, acrylic eyes and Wayne Cooper Flex Eyes! Big Game, Fish and Bird Eyes featuring exquisite craftsmanship are available in many different sizes. Taxidermists and woodcarvers alike consider Van Dyke’s eyes to be the finest on today’s market. Our in-house artists use an environmentally safe fired enamel paint which captures the most brilliant and realistic colors, assuring you of the most accurate coloration. A big customer favorite is the McKenzie/Joe Meder deer eye featuring a revolutionary new patent pending breakthrough effect called Liquid Lens™ Technology. View our online video by McKenzie/Joe Meder. Eyes are sold per pair.